In an attempt to revive his fallen friend, Gou Shijima managed to do the impossible& revive one of the most powerful Roidmudes ever, Heart! Simultaneously Gou managed to merge the Cores of Medic & Brain into Heart’s new body. Uniting their hearts and Cores together these 3 Roidmudes became the Kamen Rider to surpass even Drive. Debuting in the Heart/Mach v-Cinema, and finally available in figure form, it’s S.H. Figuarts Kamen Rider Heart Type Miracle! Kamen Rider Heart as you’ll undoubtedly notice, is heavily based on Drive’s own Type Tridoron form. Much like the suit in the movie, this figure reuses a majority of Tridoron’s parts. But the new components incorporated into the body are derived from Heart’s original Roidmude form. It’s an odd fusion, but one that somehow works very well. While this is a pretty sparse release, Heart Type Miracle still has plenty of charm to it. Now if we could just get the mismatched Type Speed/Wild/Technic from Bandai, then all of Hearts’ forms would be represented in this line. We’ve attached a selection of images to this post, but you can view the complete 60+ image gallery after the jump. Just click “Discuss on the TokuNation Forums” at the bottom of this post to be taken to the full review and gallery. Next time we’ll be back with another new gallery from Space Sheriff Gavan! The first of the Promised Number arrives in the S.H. Figuarts line up! An extensive and elaborate repaint of the original Heart Roidmude, this figure represents the charismatic villains ultimate evolution. This is S.H. Figuarts Over Evolved Heart Roidmude! As mentioned above this figure is nothing more than a repaint of the original Heart Roidmude. So that does mean that the physical & functional shortcomings of this mold will still persist as they always have. However the glorious golden paint scheme, the dark paint wash, and bright purple used on Over Evolved Heart bring out all of it’s best details & personality. This figure may still be limited, but Heart has never looked better than he does here. He does however still have a very limited selection of accessories, just the same 3 sets of hands that came with the first release. Here’s hoping that eventually the Brain Roidmude prototype that was shown off a while back will be able to join Heart one day. We’ve attached a selection of images to this post, but you check out the full 50 image gallery after the jump by clicking “Discuss on the TokuNation Forums” at the bottom of this post. Next time we’ll be back with a gallery from Kamen Rider W! A pair of new Tamashi Web Exclusive releases have just gone live on the Tamashii Web Shop! From Kamen Rider Drive we have S.I.C. Heart Roidmude. A companion piece tot he recently released S.I.C. Drive and the upcoming Mashin Chaser. This version of Heart is more directly inspired by Takayuki Takeya’s original design for the character, as indicated by the heart ventrical wings on his back. Heart will be released in October as a Tamashii Web Exclusive for 8856 yen. Next up is an odd one. The S.H. Figuarts Helldiver is a companion piece for Kamen Rider ZX. A figuart released way back in 2013, numerous ZX’s had serious QC issues, not limited to but including poor paint applications, loose part fits, etc. It’s surprising to see his bike released nearly 4 years later, and unlike other recent Showa releases, there is currently no two-pack with a slightly altered ZX offered. For now, the Helldiver will also be released in October, for 5400 yen as a Tamashii Web Exclusive. Get with your preferred middleman or service to secure orders for these releases soon! Kamen Rider Drive continues it’s steady pace of new releases with yet another new announcement! Seen previously at Tamashii Nations 2016 in October, we now have official release details for S.H. Figuarts Kamen Rider Heart Type Miracle! Kamen Rider Heart, the special form Heart assumes in the V-Cinema bearing his name, is itself a reuse of the Drive Type Tridoron suit. And like the suit itself, this figure is an intricate repaint & remold of Type Tridoron. Though much like the original SHF Heart Roidmude release, it’s pretty lacking on the accessories. On 2.5 sets of hands and the Heartron Shift Car are included with this release. S.H. Figuarts Kamen Rider Heart Type Miracle will be released in June for for 6264 yen as a Tamashii Web Exclusive. Be sure to contact your favorite middleman site or service in the near future to secure an order for this upcoming release! Official images and release info have just dropped courtesy of Tamashii Nations for S.H. Figuarts Super Evolved Heart Roidmude! Super Evolved Heart was confirmed for release late last month but these official images finally give us a really great look at it. But don’t expect this release to outdo the originals’ accessories. As with the first S.H. Figuarts Heart, Super Evolved Heart only includes 3 sets of additional hands. S.H. Figuarts Super Evolved Heart Roidmude will be released as a Tamashii Web Exclusive in May 2017 for 5940 yen. Seen most recently at the Tamashii Nations 2016 event, S.H. 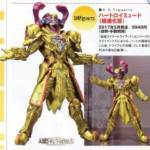 Figuarts Super Evolved Heart Roidmude has been teased out for release for some time. Thankfully now it’s been confirmed for it! Super Evolved Heart is of course a straight gold repaint of the original Heart Roidmude release. For those unfamiliar, this gold super-evolved form debuts near the end of the Kamen Rider Drive TV series as well as gold forms for Brain & Medic. Gold Heart isn’t likely to include any new accessories, but if the original is any indication this release will likely include 3 sets of hands. S.H. Figuarts Super Evolved Heart Roidmude will be released in May 2017 as a Tamashii Web Exclusive for 5940 yen. 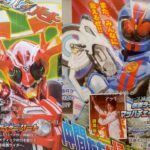 Kamen Rider Heart & Kamen Rider Mach Chaser Fully Revealed! Some new images from the upcoming Kamen Rider Drive V-Cinema project have been posted online! This is our first look at Kamen Rider Heart! The former Roimude uses a new Shift Car- the Shift Heartron– and becomes a hero! This suit is heavily modified from Drive’s own Type Tridoron. Second, we get to see Kamen Rider Mach in a new form- Kamen Rider Mach Chaser! This suit is modified from the end-of-series Chaser Mach powerup, and is unlocked by a new Signal Bike- the Shift Rider Crosser. Drive Saga II will be released to Blu-Ray & DVD on November 16, 2016! Following up on their reveal at this weeks’ Tokyo Toy Show we now have full official images for the next Premium Shift Car Set from Premium Bandai! 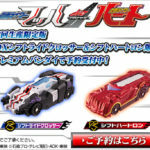 This next exclusive 2 pack will feature the DX Shift Hearttron & DX Shift Ride Crosser from the upcoming Kamen Rider Mach/Kamen Rider Heart V-Cinema! The pair are incredibly unique Shift Cars, Hearttron is based on Shift Tridoron while Ride Crosser seems to be a mostly original tooling. Both look fantastic and feature interactions with the Drive Driver & Mach Driver respectively. Shift Hearttron & Ride Crosser will ONLY be available as pack ins with the Drive Saga Kamen Rider Mach/Heart deluxe Blu-Ray set. The set itself retails for 14,040 yen. Get with your preferred middleman to secure this set today!